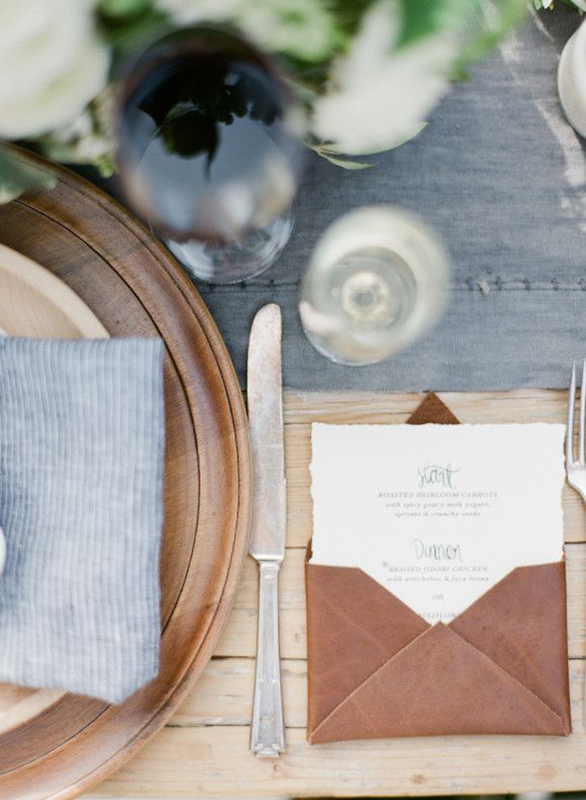 Rustic Luxe Brown Leather Wedding Inspiration! 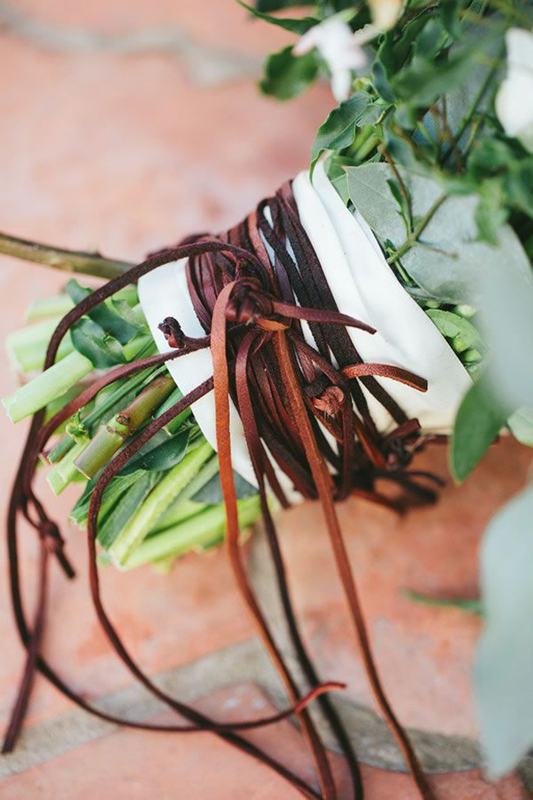 Home > Inspiration > All > Rustic Luxe Brown Leather Wedding Inspiration! 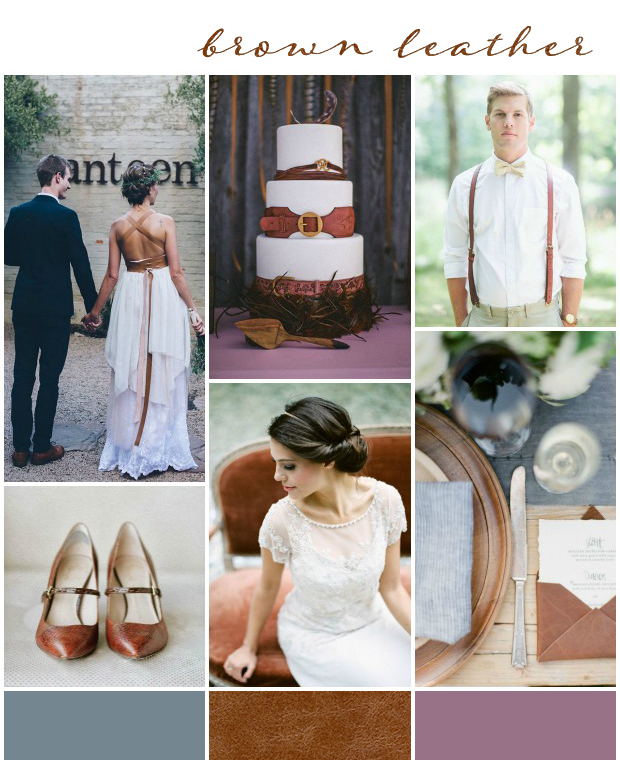 If you’re looking for a stylish yet laid back, rustic vibe for your wedding day, I recommend a touch of brown leather! 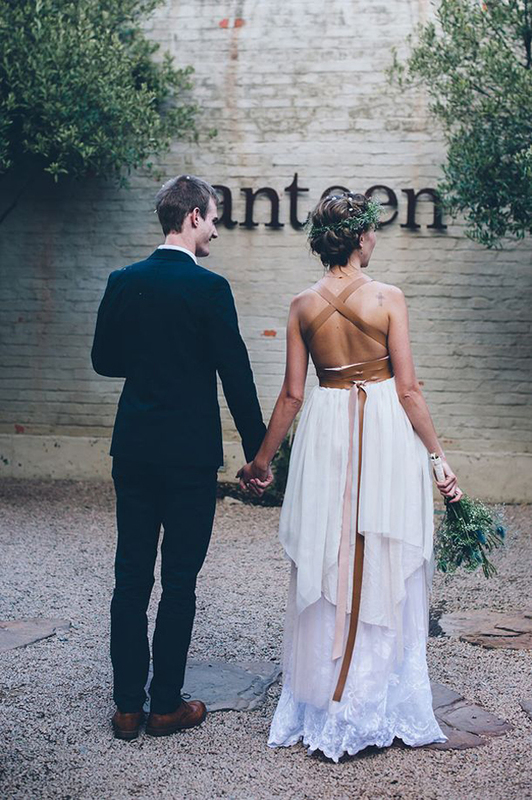 I’m totally obsessed with the leather straps on the boho wedding dress above. So effortlessly gorgeous. Dress your maids in casual separates for the ultimate laid back look and then accessorise with mix and match leather belts, shoes and sandals. Extra boho points for that worn-in leather look. 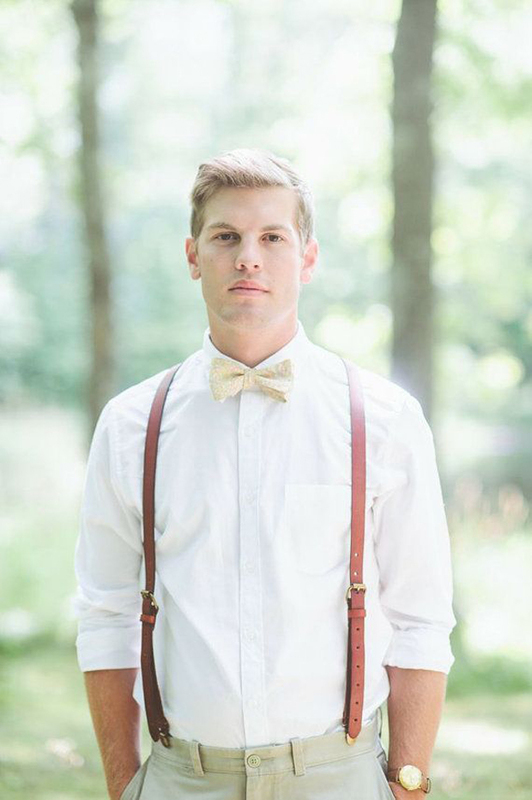 Don’t forget your groom with these brown leather braces / suspenders. Cool, relaxed and stylish. Accessorise your men with personalised leather hip flasks and trendy brown brogues. 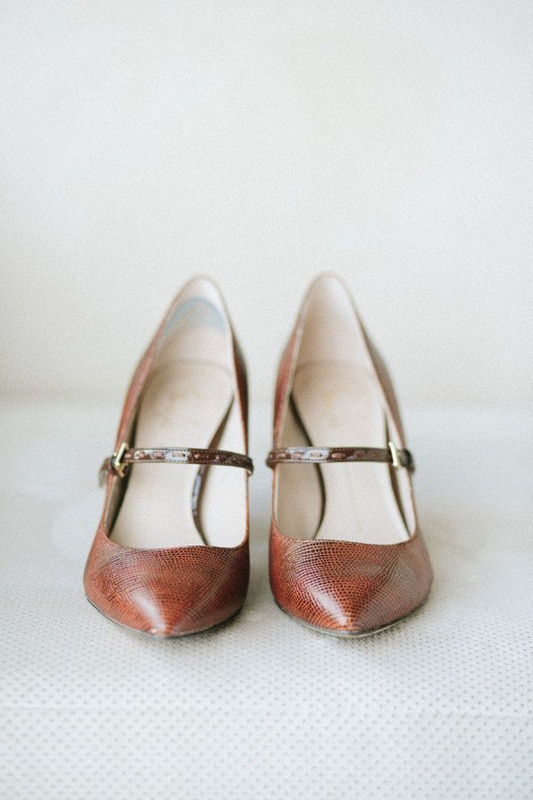 There’s no reason that brown leather can’t creep into your wedding styling too. For table place names you could use leather luggage tags with your guests names. 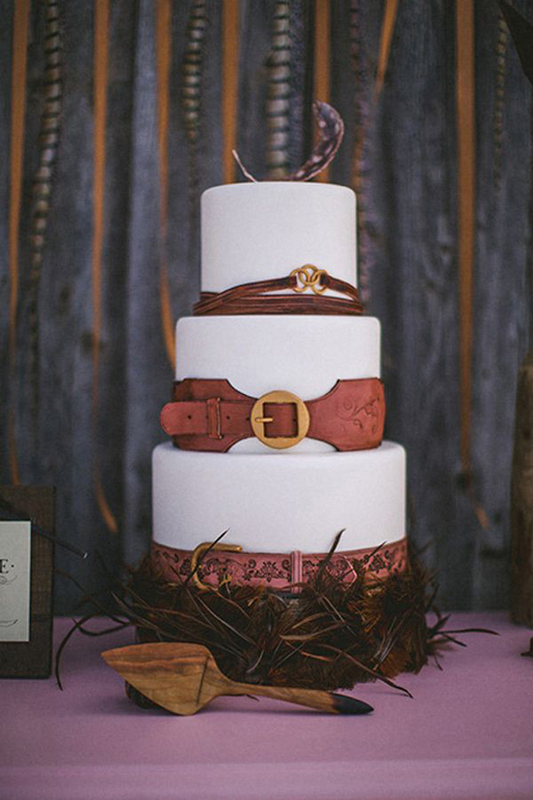 Or even decorate your cake with rustic style brown belts (edible of course). For a luxe and rustic chic look & feel to your leather inspired wedding, I absolutely adore leather-like wedding stationery. The menu holder above is awesome! And anything with leather fringing is absolutely amaze. The thing about leather is that it can be both masculine and feminine, beautifully boho casual and luxe and lovely. You decide. Of course, I don’t need to tell you lovelies not to do all of the above. Just pick out a few key ideas to pull the whole look together and stick to the type of leather that is you and your style. Going To The Chapel: Daniel & Emily! On Saturday I also welcomed talented celebrity wedding photographer Gemma Ward to the blog with a fab Q&A, it’s definitely a must read. 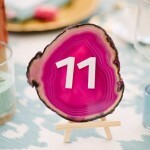 And last week, I welcomed a quirky wedding venue finding directory to the blog. If you’re looking for a unique wedding venue, please do check out Truly Quirky Wedding Venues. Great pics ! thank you for sharing with us ! 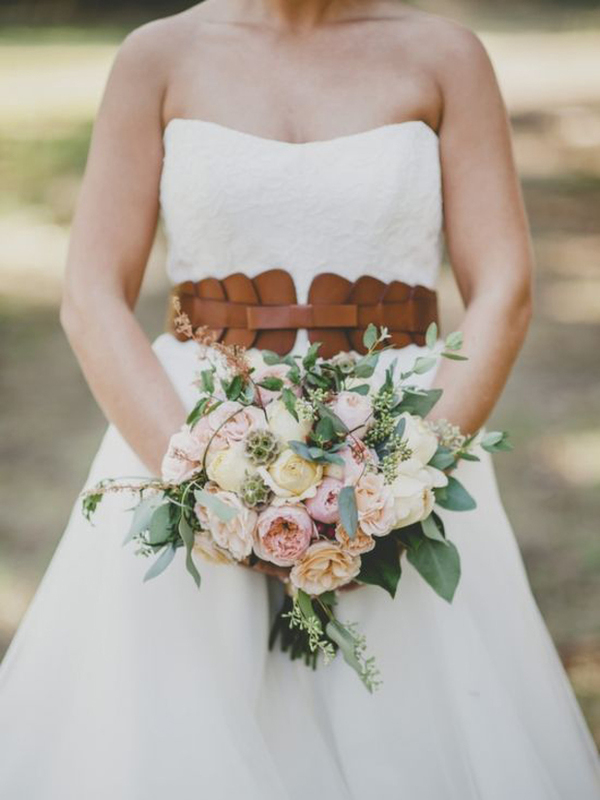 Where can I buy the wedding dress with brown leather straps?? ?